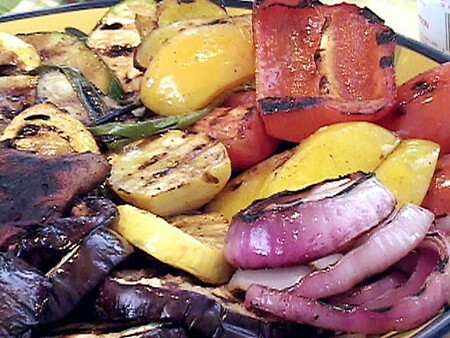 Summertime veggies bring a healthy joy to our day, and what better way to enjoy them, than grilled. I promised you everything youll ever need to know about grilled veggies and I hope this does the trick.First Ill share with you a timing chart that I find helpful; then Ill share one of my favorite, lip-smackin delicious grilled veggie recipes; and finally, Ill share a video from Giada De Laurentiis that shows how simple it is to grill your veggies indoors. Whether you grill your veggies on the barbie (my favorite way) or inside on the stove, theyre sure to be a hit with your family. From hardy vegetables like broccoli to delicate slices of garden-fresh tomatoes, its hard to coordinate an assortment of perfectly cooked veg. Let this handy guide help you. (Psst! flip the hardiest veggies once about halfway through). Here is one of my favorite ways to do a quick and easy grill on the barbie. Step One: Prepare vinaigrette: In a medium non-reactive bowl, jar or blender, combine lime juice, cilantro, ginger, honey and chile powder. Whisk, shake or blend ingredients until combined. Add 1 tbsp extra-virgin olive oil and whisk, shake or blend to combine. Add remaining 1 tbsp extra-virgin olive oil and sesame oil. Whisk, shake or blend until oils are well incorporated and emulsified. Step Three: Arrange vegetables on a large platter. If vinaigrette has separated, whisk, shake or blend to re-emulsify. Drizzle over vegetables and serve immediately.